Mayweather vs McGregor - Is Mayweather the G.O.A.T.? 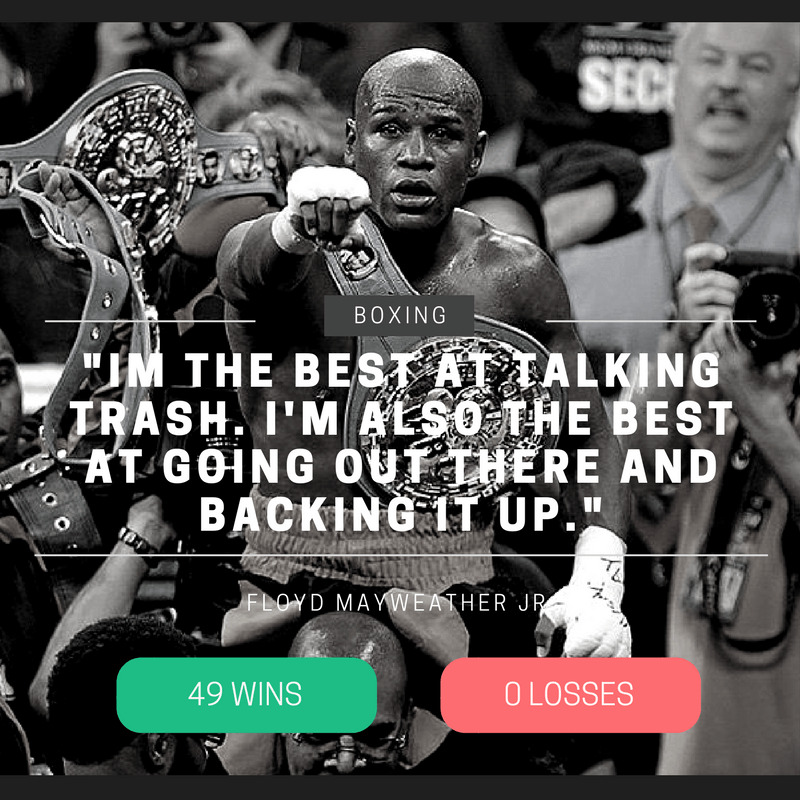 49-0 - Is Mayweather the G.O.A.T.? Floyd Mayweather Jr is certainly the most successful boxer of the modern era, and his professional record currently sits at a perfect 49-0, equal with another all time great fighter in Rocky Marciano. The upcoming fight against Conor McGregor presents a great opportunity for Floyd to reach a record of 50-0, and he is widely tipped to achieve this feat. Over the course of his professional career that began over 20 years ago, Mayweather has encountered a list of big names and world champions. He has a record of 26-0 in world title fights, has won fifteen world championships and the lineal championship in four different weight classes. Of his 49 victories, 29 have been by decided by knockout. The other 23 were decision victories. Mayweather is just as famous for his self-promotion as he is for his fights, and he has featured in several big-money pay per view fights over the course of his career. The biggest was undoubtedly his fight against Manny Pacquaio, billed 'The Fight of the Century, which attracted approximately 4.6 million viewers. To date he has featured in sixteen pay per view bouts, earning an estimated $1.3 billion in revenue. If you ask the man himself, Floyd would tell you that he is the greatest of all time, or simply just rock his TBE shirt that indicates there he certainly does not lack self belief. But although successful in the modern era, it is hard to make the same argument when we discuss boxers throughout history. It would be fantastic to see whether Mayweather, such a fantastic defensive fighter, go head to head with some of the greatest boxers of other generations. While this isn't a possibility, we list some of the best in history and how they compare to The Money. As mentioned above, Rocky Marciano shares the emphatic record of 49-0 in professional bouts and is widely considered one of the best boxers of all time. He is best known for his emphatic knockout-to-win record of 87.75%, one of the greatest ratios ever, and a hypothetical match up between him and Mayweather would be a fantastic spectacle that would definitely rival the Fight of the Century for viewership. Ricardo Lopez is another name that needs to be mentioned in this list - the Uruguayan fighter retired with 51 wins, no losses and a draw that presents the only flaw in his record. He excelled in the strawweight division and defended his WBC Minimumweight Championship a record 21 times. While lesser known and certainly not on the same page as Mayweather in terms of self-promotion, Lopez was certainly one of the greatest fighters going around and presents another challenge for Mayweather should he want to beat his record of 51 wins. While 49-0 seems like an impressive record, the reality is that Mayweather has had nowhere near the amount of fights as some of history's best fighters, which makes it much harder to give him the G.O.A.T. tag. Previous generations of boxers would routinely feature in anywhere between 12 and 20 fights a year, opening up a much greater possibility for losses. Julio Cesar Chavez holds a number of impressive records, and is also a name that is routinely mentioned when discussing the greatest of all time. Chavez is a six-time world champion across three weight divisions and held a phenomenal undefeated record of 89 wins and 1 draw across 13 years before ending his career with 107 wins, 86 by knockout victory. His first 87 professional bouts were all victories. Sugar Ray Robinson is a man who topped 87 consecutive wins is widely considered the best boxer of the 20th century and most in the boxing industry consider him incomparable with the likes of modern boxers like Mayweather. But this is simply because the 1940's and 50's boxing scene was just so different from today's. The great boxer managed 88 consecutive wins midway through his career after starting out with a 40-0 record. If it wasn't for his loss against Jake LaMotta in 1943, Robinson would have had a staggering 129-0 record, although 128-1 isn't too bad either! When Robinson hung up the gloves he had amassed 200 fights in total, winning a whopping 173 and 108 of those were by knockout. Great, But Not The G.O.A.T. Floyd Mayweather will go down in history as one of the best fighters in history when he finally retires from the sport (something that he has already done a couple of times). He will be best remembered for his perfect record (he won't lose to McGregor), defensive abilities and the way he has up-levelled the promotion and marketability of boxing. But Floyd cannot be considered the G.O.A.T. simply because he has entered the boxing world in an era that does not present the same challenges as the fighters of the past had to overcome. This of course isn't the fault of Mayweather, who has defeated every opponent he has come up against, but it is hard to see him having the same success in past eras. Boxing was one of the most popular sports in the world in the first half of the 20th century, long before MMA or any of the other types of combat sports rose to popularity. Crowds of people would flock to boxing matches in the numbers now only seen at American Football or European Soccer matches, and naturally the competition was much more fierce. Some of the greatest fighters to ever grace the sport of boxing were nowhere near undefeated simply because they came up against potential championship winners in every fight and routinely fought in more than fifteen fights per year. Mayweather by comparison has featured in an average of under three fights per year over the course of his career, allowing more time for training, recovery and opponent analysis. Speaking of analysis, champions from the early days of boxing didn't have the luxury of watching footage of a fighter before they came up against them. Boxers could not come into a fight with set tactics and would need to routinely change strategy mid-fight to stand a chance at competing. While Mayweather may consider himself the GOAT, or TBE or however he wishes to put it, only one thing is certain - he has a record of 49-0, soon to be 50-0 and he is the best fighter of the 21st century. We will never be able to compare him to champions of the past simply because we can't put Mayweather in the ring with greats like Chavez, Robinson, and a host of other great names that aren't mentioned in this article. What we can do is respect a great fighter and the best we're likely to see in terms of overall record for a long time to come. Boxing may never reach the heights of the early 20th century as other sports become more popular, so perhaps the millennials that Mayweather appeals to most won't ever see a better fighter. It's therefore worth appreciating the man for what he is, a gifted athlete and incredible boxer. What are your thoughts? Is Mayweather the best of all time? What other boxers deserve to be mentioned here? Join in the conversation on our Facebook page and discuss your opinions with other boxing fans.